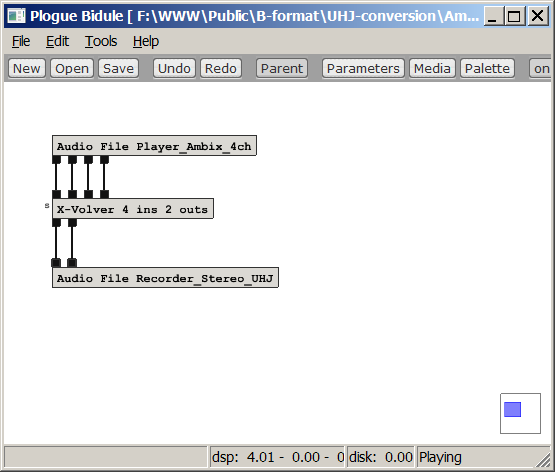 This page explains how to use the X-volver plugin for converting between B-format (Ambix variant) and UHJ surround formats using any multichannel VST host, such as my favourite one, Plogue Bidule (but also Audio Mulch, Reaper and many others can be used). A B-format Ambix signal is, in general, a 4-channel signal (WYZX). W is the sound pressure signal, as captured by a perfectly omnidirectional microphone. X, Y and Z are the "first order spherical harmonics" which in practice are proprtional to the Cartesian components of the particle velocity vector. It is possible to "pack" the horizontal B-format signals (WXY) in just two channels, suitable for stereo reproduction, and called UHJ. UHJ is a "standard" stereo waveform, which indeed includes information capable of driving a complete horizontal surround system (for example, equipped with 5, 6 or even 8 loudspeakers). The best way to listen at UHJ-encoded material is always to re-extract from it the B-format and decode it throug an Ambisonics decoder or something similar. Listening directly at UHJ through a normal stereo system sounds usually too much reverberant, as You hear from front any sound which should come from behind You. These equations were implemented in frequency domain, and transformed back to three stereo impulse responses in time domain, at a 48 kHz sampling rate. 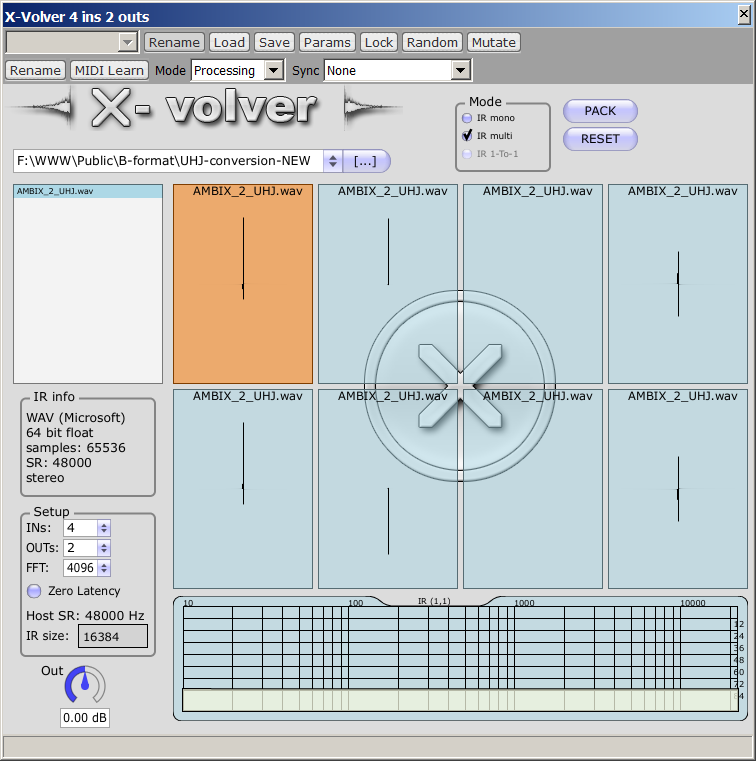 They were packed in a single 2-channels file to be used as a 4x2 filter matrix inside the X-volver VST plugin, with 4 inputs and 2 outputs. Remember that You can download the filter matrix and the Plogue Bidule setup from my web site, just click here. You can also be interested in doing the inverse procedure, that is, converting an UHJ stereo signal into a B-format Ambix soundtrack (and possibly further to 5.1). Look at the corresponding new UHJ-to-Ambix conversion page for this.